Chromogenix Coamatic® Antithrombin is a chromogenic assay kit for in vitro diagnostic determination of antithrombin activity in human plasma. The use of factor Xa in preference to thrombin eliminates interference from heparin cofactor II and thrombin inhibitors. 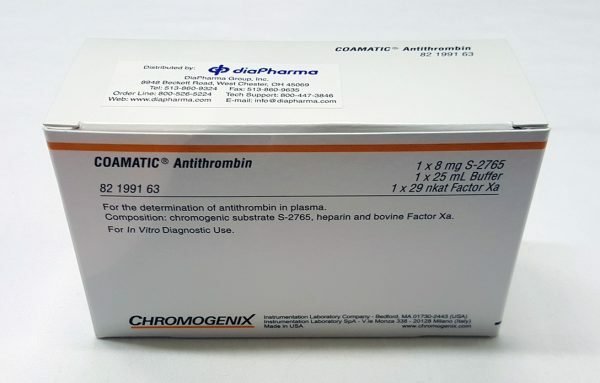 This FXa-based antithrombin test kit has been shown to discriminate better between AT-deficient and non-AT-deficient individuals than a thrombin-based assay [Demers et al 1993]. It also gives accurate results in patients who are receiving heparin therapy [Bohner et al 1994]. Simple, accurate and convenient. All methods are based on FXa inhibition. Allows accurate determination of antithrombin in patients receiving heparin therapy. Superior reagent stability. Validated and documented protocols for a wide range of instruments. Suitable for both large and small laboratories.